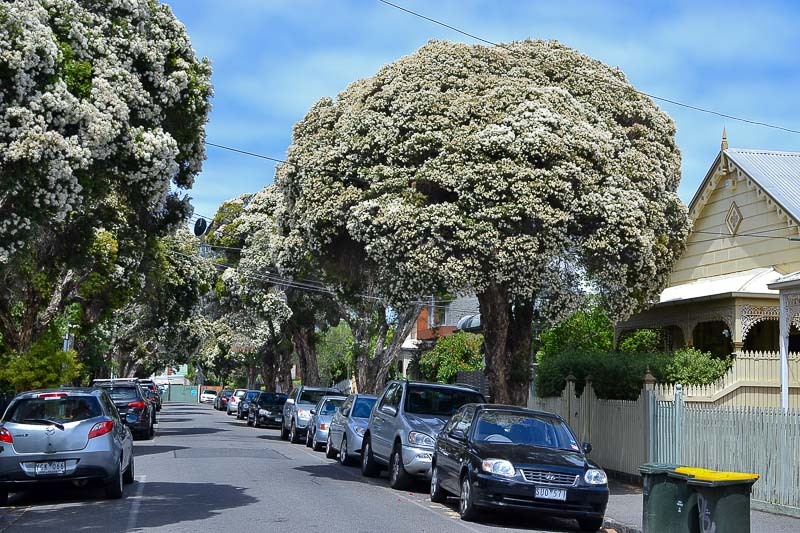 Snow In Summer is a flowering and essential oil yielding tree native to Australia, its natural range extending across warm temperate and subtropical areas in the east of the continent, where it occurs in pockets of coastal forests. It has a preference for swampy, poorly drained sites or sites that are subject to flooding, or that turn into watercourses during the rainy season. 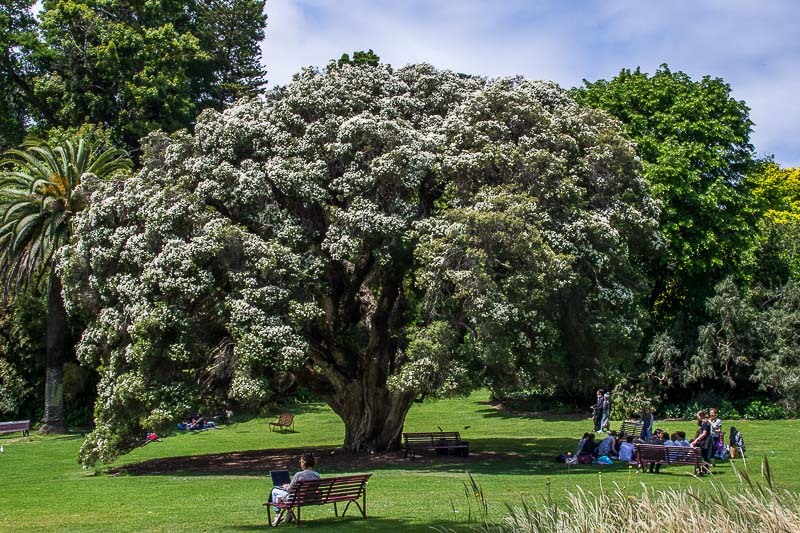 On favourable sites, it is moderately fast-growing and reaches heights of up to 15 m (50 ft), though is more commonly 5 to 10 m (16 to 32 ft) tall and develops a stout, occasionally forked trunk supporting a densely branched rounded crown. 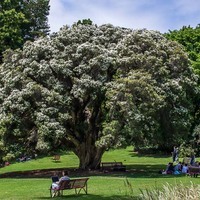 The bark is off-white to cream coloured and sheds in papery sheets that persist on the trunk, forming layers of dry dead bark that can be peeled off by hand. The leaves are very small, lance-shaped, dull blue-green and closely arranged along thin branchlets, themselves densely packed in the crown, casting a deep shade on the ground below. They remain green and on the tree throughout the year. 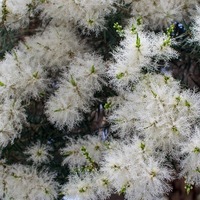 In spring, spikes of fluffy white flowers with the appearance of snowflakes cover the crown, almost completely hiding the foliage from view. They are followed by small, woody, cup-shaped seed capsules closely spaced along the branchlets, becoming dry and light brown when mature with many tiny seed inside. 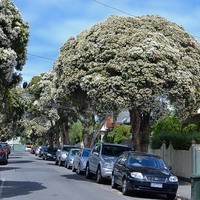 It is sometimes cultivated in parks or as a street tree for it shapely form, showy flowering display, interesting and unusual bark and the shade it provides. 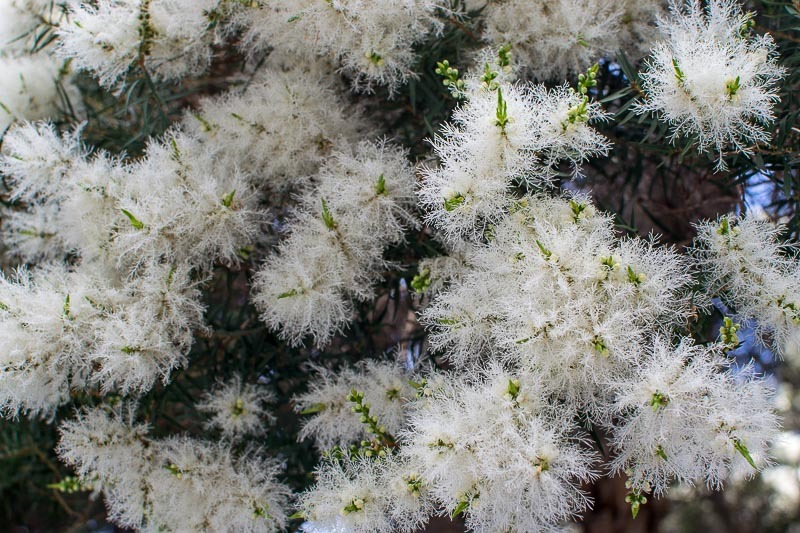 The leaves on steam distillation yield commercial quantities of 'Tea Tree oil', though they are less heavily exploited than the leaves of Melaleuca alternifolia, the principal source of Tea Tree oil. The oil is colourless to pale yellow and is extracted mainly for medicinal use, as an antiseptic, antibacterial and antifungal agent. Oil yields range from 1 to 2% of the leaves by weight, according to the proportion of old- to new-growth in the distilled material. The wood is hard and durable under water, making it suitable for pilings submerged on swampy ground or in water, or if properly dried can be used for firewood. The peeled bark makes excellent kindling or fire starting material and has long been used for this purpose by Indigenous Australians. The flowers are actively visited by honeybees, as both a source of nectar and pollen but these are produced in only moderate amounts. The small amount of honey produced is dark amber and strongly flavoured. Tea Tree oil has natural antiseptic, antibacterial and antifungal properties and can be applied to insect bites and stings, wounds, burns, acne, warts, athlete's foot, vaginal yeast infections and oral infections, including gum ailments. It is also used in inhalation treatments against coughs, colds and flu. Grows naturally in moderately humid warm-temperate to subtropical climates, generally in areas with annual lows of 6 to 17 °C, annual highs of 18 to 28 °C, annual rainfall of 600 to 2000 mm and a dry season of 6 months or less. New plants are usually started from seed. Performs best on slow- to free-draining clay, loam and sand soils of a moderately acid to neutral nature, generally with a pH of 5.0 to 7.5 and on sites with full to partial sun exposure. It is moderately salt tolerant with growth reportedly unaffected by soil salt conditions equivalent to up to 3.0 grams of dissolved salt per litre of water or roughly one-twelfth the concentration of seawater. It is listed as a weed in at least one publication but there does not appear to be any record of it becoming naturalised or a serious weed anywhere outside of Australia, despite its introduction and cultivation in Florida, Louisiana, California and other non-native regions. The roots are moderately invasive and a minimum planting distance of 4 m (13 ft) from any underground pipes is recommended.